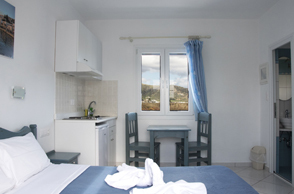 Ikaros is a family hotel which offers self catering accommodation with pool and garden. 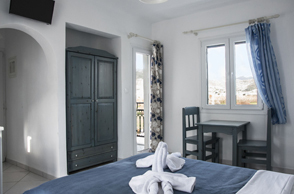 It is situated in a quiet corner near the city of Naxos (800m) and very close to the saint George beach (300m). Moreover, it is easily accessible from the airport, being only 1,5 km away from it. This unique location enables our guests to combine entertainment along with relaxation. Bar, 24-hour Front Desk, Garden, Terrace, Family Rooms, Free Parking, Safety Deposit Box, Luggage Storage. Fishing, Children's Playground, Windsurfing, Biking, Walking, Cycling, Diving, Horse Riding, Snorkelling, Outdoor Swimming Pool. Laundry, Internet Services, Currency Exchange, Bicycle Rent, Car Rental, Tour Desk, Fax/Photocopying, Wi-Fi / Wireless LAN.